There are only 4 days until Christmas Eve! As everyone anxiously prepares for the big day, we thought we would share a few tips today on how you can have a more royally-inspired Christmas. While you likely can’t decide at the last minute to take your whole family to the English countryside, there are several ways you can add a dash of British regality to your holiday celebrations no matter where you are. You’re probably thinking “But… Christmas is only a few days away! How can I possibly do these now?” The great thing about the vast majority of these things is that they will cost nothing more than you will already be spending and may only require a few small timing changes. Here are the WWKD 8 Keys to celebrating a more royal Christmas. When the Royal Family gathers at Sandringham, the guest list is extended to family only, but often a wide assortment of family members to ensure everyone gets together to celebrate the season. 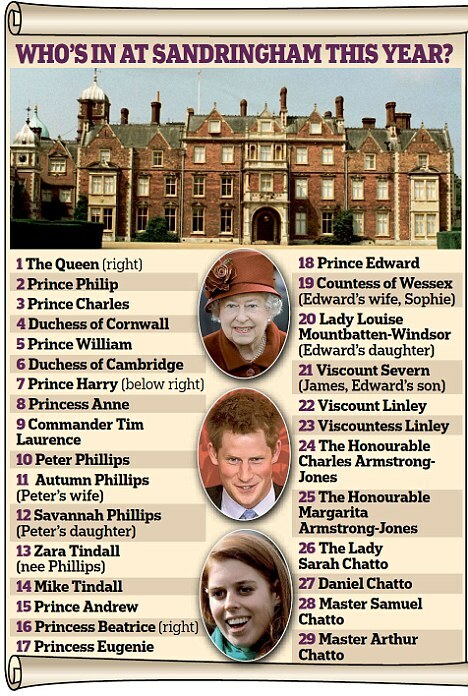 Take a look at this guest list from 2011 (via the Daily Mail), Kate’s first year as a formal member of the family, when there were 29 people in attendance. While not every family can get together for geographic, economic or other reasons – if you are able, it’s a wonderful tradition and reason to get together with the people who, for better or worse, you are related to. I can think of no better day to get dressed up for whatever meal your family deems to be their formal Christmas feast. Whether it is on Christmas Eve, as is the case with the Royal Family, or on Christmas Day, the thought and preparation which go into these meals should be respected and wearing a nice dress or skirt is a wonderful nod to the chef as well as the celebration. It’s not just any old day! The Royal Family wears formal evening gowns and jewels for their Christmas Eve dinner at Sandringham. The Duchess of York has stated that she had to have 7 changes of clothes for a 24 hour period on Christmas Eve/Day as a member of the royal family. There is nothing that reminds me more of Christmas more than the fresh smell of pine trees. If you have a real Christmas tree, you may get some of that scent in your home naturally, but in my experience it is not very strong. And if you have an artificial tree, you are not out of luck… There are several winter scented candles which are available to make your home smell like Christmas. Don’t buy the cheaper candles that smell like sugar cookies or gingerbread – they smell cheap and are often far too overwhelming after being lit for a few hours. We know that Kate definitely approves of scenting her home with candles for the holidays – as proof, she scented Westminster Abbey for her wedding with her favourite scents by Jo Malone. The royal family is said to gather at Sandringham’s White Drawing Room at 4pm on Christmas Eve -changed into their tea outfits – and the Queen will encourage the young royals to help put the finishing touches to the Norfolk Spruce Christmas tree taken from the estate. Don’t think you have to decorate everything yourself! Get your kids involved, or if you don’t have any, try and find some nieces or nephews who would love to participate. Before I had children, I would invite my adult siblings over to help decorate the tree as we looked at decorations from when we were kids. Now that I have children, I try and let go of my perfectionist tendencies and let them decorate the tree with their own flare. Making it a fun group activity will not only take some of the stress off you, but will be creating memories for years to come. This is an old German tradition, one in which the Royal Family still participates in today. The Queen views Christmas Day as a religious holiday so the family’s gifts are opened the night before. While I now have small children who wait anxiously for Santa Claus to arrive on Christmas morning, I still wrap up two small presents for them to open on Christmas Eve after we return from Church – a new pair of Christmas pyjamas and a Christmas book with a personalized message inside. I love the tradition and more importantly, love that it will be a fond Christmas memory for my boys when they get older. Much like you should wear a nice outfit to dinner because it’s not a normal day… Make it something special! The royal family uses candlelight to illuminate the three-course formal meal on Christmas Eve. Try it out, even if this is not something your family normally does. It makes the meal instantly more special than normal and will create a more relaxed atmosphere. It’s amazing how it works! The holidays are well-known for their libations. For cocktail hours at Sandringham, it’s been reported that martinis are popular, though William and Harry are said to be more partial to Sandringham cider. Our family makes a champagne cocktail which is only served one time a year and everyone has a glass. It’s nice to have a special cocktail that can be served to everyone at a special hour (we wait until 5pm). The royals also have liqueurs in the evening after their formal dinner. We share this because the last thing anyone wants to do at Christmas is hear about someone else’s diet. It’s 24 hours of delicious foods, rich desserts and tempting cocktails. Enjoy them – and if you feel terrible about the indulgence, head to the gym first thing on Boxing Day morning. Our advice is to have one or two bites of absolutely anything you want (or twenty-two if it’s delicious), eating slowly as to savour the flavours and stop when you are full. You’d be surprised how taking the time to enjoy the treat in your mouth can slow you down and drastically drop your calorie intake. Kate definitely is said to enjoy the holiday treats at Sandringham, including homemade scones and jam, and if the Duchess can have a few bites, so can we. I would love to hear your family’s Christmas traditions. What does your family do that makes the holidays so special? The Royal family also celebrates by going to Church together. That can put you in touch with the deeper meaning of the season and share a special time together. Excellent point, and reminder of the true meaning of the season. Thanks for the comment!